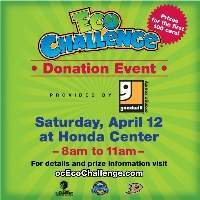 Come join the Anaheim Ducks’ mascot Wild Wing, Goodwill, the County of Orange, and Discovery Science Center as they celebrate Earth Month this April. All donations support the mission of Goodwill of Orange County to help people facing barriers get and keep jobs which provide purpose, pride and dignity. Now in its 90th year, Goodwill of Orange County is in the business of helping people who are facing barriers to enter the workforce in a meaningful, fulfilling manner. Founded on the belief that every person should have the opportunity to achieve the independence that work provides, Goodwill is most famous for being the conduit where donated goods are sold in America’s favorite thrift stores to generate the revenue that provides the services to those who face employment challenges. Goodwill is our country’s leader in creating and providing quality training and employment services to empower individuals to be productive and independent. In 2012, Goodwill was named one of Orange County’s Most Trusted Brands. For more information on how Goodwill serves the community, please visit www.ocgoodwill.org. The mission of the County of Orange is to make Orange County a safe, healthy, and fulfilling place to live, work, and play, today and for generations to come, by providing outstanding, cost‐effective regional public services. OC Waste & Recycling helps fulfill this mission by meeting the County’s solid waste disposal needs by providing waste management services, protecting the environment, and promoting recycling in order to ensure a safe and healthy community for current and future generations. OC Waste & Recycling manages one of the nation’s premiere solid waste disposal systems, which serve 34 cities and over three million residents. OC Waste & Recycling operates a network of three active landfills and four household hazardous waste collection centers. The Anaheim Ducks are celebrating their 20th anniversary season during the current 2013-14 National Hockey League campaign. The club was born in 1992 and played its first-ever game on Oct. 8, 1993 at Honda Center (then Arrowhead Pond of Anaheim). One of 30 NHL franchises located throughout the United States and Canada, the Ducks have played to over 90% capacity crowds in their history at the 17,174-seat Honda Center. On June 20, 2005, the Ducks franchise was purchased by Orange County residents Henry and Susan Samueli. By securing the first Stanley Cup championship in franchise history in 2007, the club also became the first team from California to win hockey’s ultimate prize. The Ducks have been to the Conference Finals three times (2003, 2006 & 2007) and the Stanley Cup Final twice (2003 & 2007). The club completed their best-ever season in 2012-13 (by points percentage), ranking third in the NHL in the regular season while also winning the Pacific Division for the second time in franchise history (also 2007). Anaheim has qualified for the playoffs six times in the last eight seasons. For over 25 years, Discovery Science Center (DSC) has been a non-profit organization that inspires and educates young minds through engaging science based programs and exhibits to create a meaningful impact on the communities they serve. With one of the largest education outreach programs in the county and an unparalleled approach at creating immersive, game-based exhibits, DSC is revolutionizing how educational content is delivered. In 2012, DSC was named one of the ten “Most Trusted Brands” in Orange County and in 2013 was awarded the National Medal of Service from the Institute of Museum and Library Services. DSC owns and operates the Taco Bell Discovery Science Center based in Santa Ana, California and will be opening a second facility in Los Angeles in 2014. For more information, call (714) 542-CUBE or visit www.discoverycube.org.